Download "Lesley Armstrong Northup Papers, 1980-1995"
2 AWTS: Lesley A. Northup Papers 2 Administrative Information Provenance: Lesley A. Northup donated her papers to the Archives of Women in Theological Scholarship in March Access: Archival papers are available to registered readers for consultation by appointment only. Please contact archives staff by to or by postal mail to The Burke Library address on page 1, as far in advance as possible Burke Library staff is available for inquiries or to request a consultation on archival or special collections research. 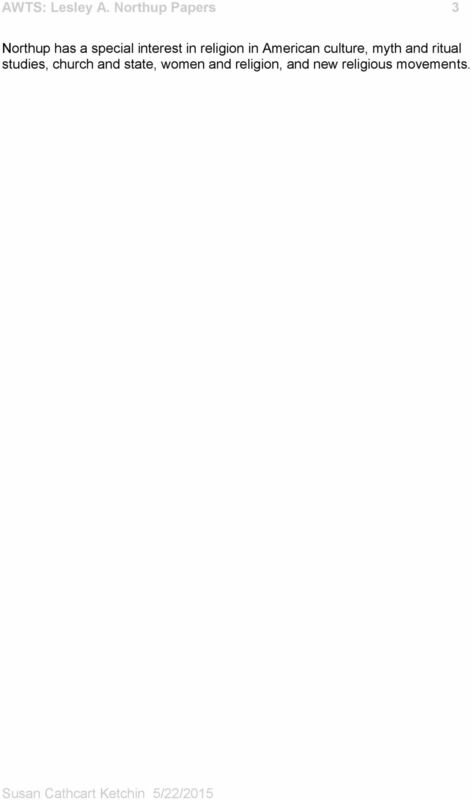 Access restrictions: The collection is unrestricted. 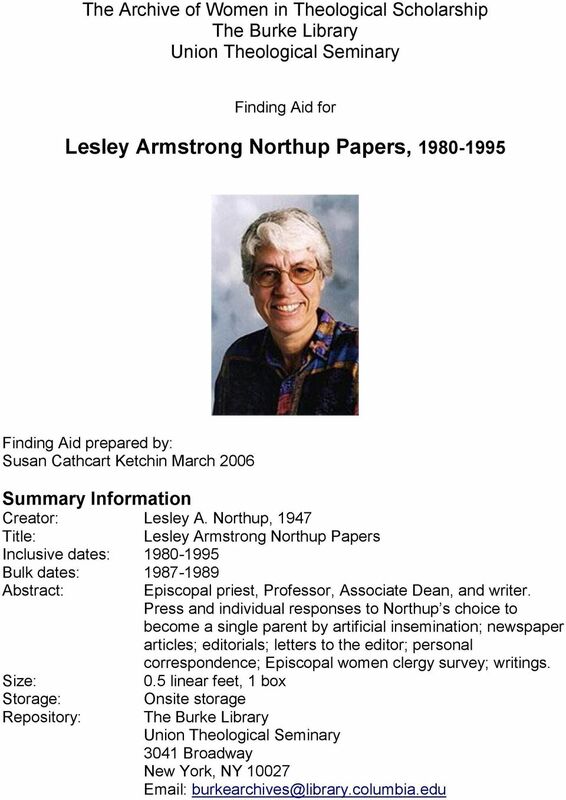 Preferred Citation: Item, folder title, series # box #, folder #, Lesley A. Northup Papers, Archives of Women in Theological Scholarship, The Burke Library at Union Theological Seminary Biography Lesley A. Northup was born on December 2, 1947 in the Bronx, New York. She graduated with a Bachelor of Arts (Speech) from the University of Wisconsin, Madison, in Northup received her M.Div in 1980 from the Episcopal Divinity School, Cambridge, MA. She went on to study for the M.A. in Religious Studies/Liturgics (1983) and a Ph.D. in Historical Theology (1991) from The Catholic University of America. 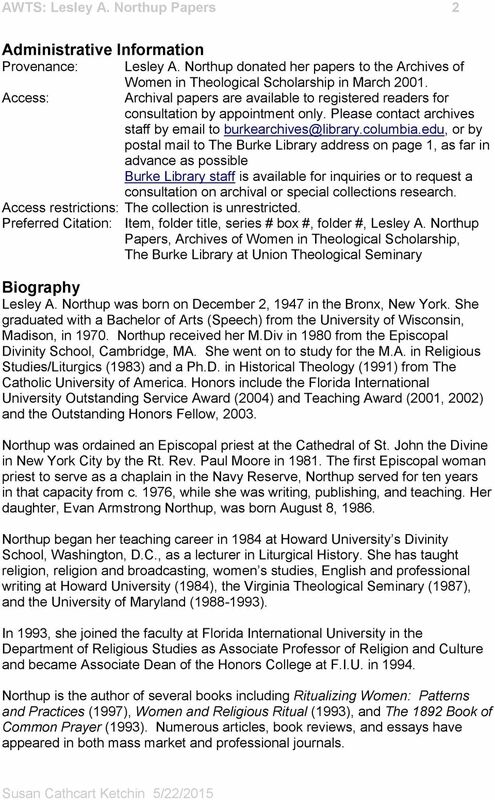 Honors include the Florida International University Outstanding Service Award (2004) and Teaching Award (2001, 2002) and the Outstanding Honors Fellow, Northup was ordained an Episcopal priest at the Cathedral of St. John the Divine in New York City by the Rt. Rev. Paul Moore in The first Episcopal woman priest to serve as a chaplain in the Navy Reserve, Northup served for ten years in that capacity from c. 1976, while she was writing, publishing, and teaching. Her daughter, Evan Armstrong Northup, was born August 8, Northup began her teaching career in 1984 at Howard University s Divinity School, Washington, D.C., as a lecturer in Liturgical History. She has taught religion, religion and broadcasting, women s studies, English and professional writing at Howard University (1984), the Virginia Theological Seminary (1987), and the University of Maryland ( ). In 1993, she joined the faculty at Florida International University in the Department of Religious Studies as Associate Professor of Religion and Culture and became Associate Dean of the Honors College at F.I.U. in Northup is the author of several books including Ritualizing Women: Patterns and Practices (1997), Women and Religious Ritual (1993), and The 1892 Book of Common Prayer (1993). Numerous articles, book reviews, and essays have appeared in both mass market and professional journals. 3 AWTS: Lesley A. Northup Papers 3 Northup has a special interest in religion in American culture, myth and ritual studies, church and state, women and religion, and new religious movements. 4 AWTS: Lesley A. Northup Papers 4 Collection Scope and Content Note The Papers of Lesley A. Northup consist of the working papers, correspondence, publications, and other related materials of Lesley Northup, a writer, teacher, and Episcopal priest, and Associate Professor of Religion and Culture and Associate Dean of the Honors College, Florida International University. The materials in this collection span much of her earlier professional career, although the bulk of the material is from the mid-to-late1980s. The bulk of the collection consists of manuscripts, notes, and correspondence related to Northup s motherhood. The papers also include personal and professional correspondence, published articles, notes and manuscripts of works-in-progress, and clippings from magazines and newspapers. 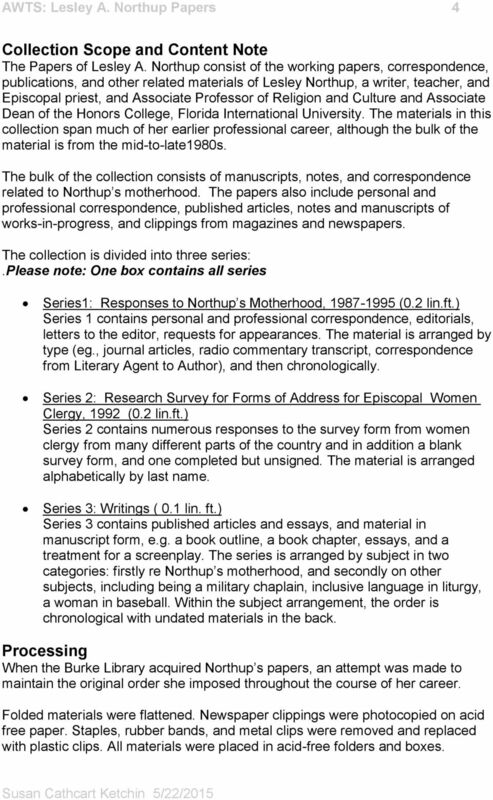 The collection is divided into three series:.please note: One box contains all series Series1: Responses to Northup s Motherhood, (0.2 lin.ft.) Series 1 contains personal and professional correspondence, editorials, letters to the editor, requests for appearances. The material is arranged by type (eg., journal articles, radio commentary transcript, correspondence from Literary Agent to Author), and then chronologically. 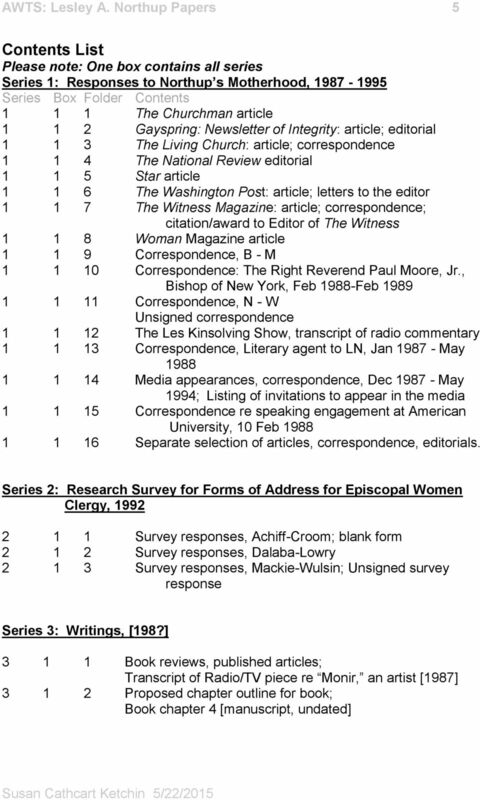 Series 2: Research Survey for Forms of Address for Episcopal Women Clergy, 1992 (0.2 lin.ft.) Series 2 contains numerous responses to the survey form from women clergy from many different parts of the country and in addition a blank survey form, and one completed but unsigned. The material is arranged alphabetically by last name. Series 3: Writings ( 0.1 lin. ft.) Series 3 contains published articles and essays, and material in manuscript form, e.g. a book outline, a book chapter, essays, and a treatment for a screenplay. The series is arranged by subject in two categories: firstly re Northup s motherhood, and secondly on other subjects, including being a military chaplain, inclusive language in liturgy, a woman in baseball. Within the subject arrangement, the order is chronological with undated materials in the back. Processing When the Burke Library acquired Northup s papers, an attempt was made to maintain the original order she imposed throughout the course of her career. Folded materials were flattened. Newspaper clippings were photocopied on acid free paper. Staples, rubber bands, and metal clips were removed and replaced with plastic clips. All materials were placed in acid-free folders and boxes. The Burke Library Archives, Columbia University Libraries, Union Theological Seminary, New York William Adams Brown Ecumenical Archives Group Finding Aid for John J. Banninga Papers, 1883 1959 John J.
Rosalie Muschal-Reinhardt Papers, 1949-2006, n.d.
W99-1244. de Velder, Marion Mert (1912-2004). Papers, 1949-2004. 6.00 linear ft.
Pressel family papers, 1890-1967 and undated. METHODIST HISTORY. April 2014. Volume LII Number 3. The Rev. James M. Lawson, Jr.
Augustana College Department of History records, 1950-1983 and undated. Western Historical Manuscript Collection Kansas City KC263 Katharine Wright Haskell (1874 1929) Papers, 1922-1928 (55 folders) Provenance: These letters were received as accession number 610kc from Mrs.
French phenomenologists, including Jean-Luc Marion, Claude Romano, and Jean-Louis Chrétien. Sihler died on 27 October 1885 in the parsonage of St. Paul Lutheran Church on Barr Street in Fort Wayne, Indiana.